Patrick Kiger, bottom row, second from right, along with other Phi Sigs in 1979. Thank you to Patrick Kiger '79 for sharing this story. "The most important thing I gained through Phi Sig was my lifelong friendship with fellow Kappa Dr. Dave Morris '79. At his wedding years later, I met my future wife Martha, who was a high school friend of his. I also learned a lot about life from my roommate and pledge brother, Ron Hummer '79. I don't know whether our era (the mid-to-late '70s) was the best or not, but it was at a time when the world seemed full of promise and potential experiences. I remember early one Sunday morning, I stumbled downstairs to be greeted by a group of Hare Krishna devotees in orange robes, who'd been invited over by some of my more open-minded brothers who hadn't been to bed yet after a night of partying." 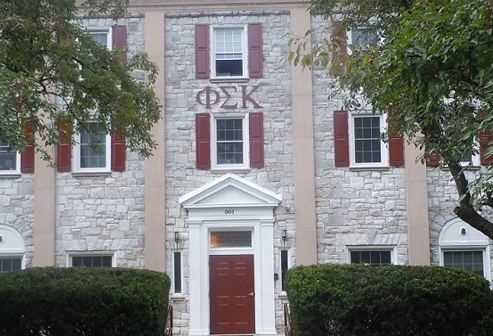 Share your best memories from your Phi Sig days in the alumni updates section!